So, you’re planning a family camp trip. If you’ve been camping before, you at least know the camping basics. If you’ve never camped before and/or you’ve never camped with children, planning this trip might seem a little daunting. For a lot of people, love of camping comes gradually and under the right conditions. You’ll want your kids to have an especially good time if you have hopes to repeat an excursion. You can’t plan for everything. Minor casualties will always occur (like a sting or a scrape), but don’t freak out. Here are some family-friendly tips to help make planning and preparing to go camping with kids memorable for all the right reasons. You know your kids. Plan your trip and activities with their age and anticipation level (excited or nervous) in mind. Plan activities that you know your kids enjoy or would like to try (swimming, canoeing, kayaking, fishing, bicycling, hiking, sports, nature walks, looking for wildlife). Then research and book a park or campground that offers the correct attributes and facilities. Have your kids be a part of the packing process. Let them give their opinions about where to go, what to pack, what to eat, and so on. 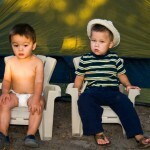 If it’s your/you kids’ first time camping, a backyard campout might be a good idea to get them used to the experience. Practice setting up your tent. Have the kids help out; let them play in and around the tent for awhile. Try some outdoor cooking; show your kids how to use some of the camp equipment; test out the sleeping bags. If it’s your family’s first time camping, consider a ground or park with running water, washroom facilities and showers – these are especially important on sandy beaches – when you’re planning your destination. This will help ease your kids into the full camping experience, keeping the first trip positive, and allowing for more adventurous trips in the future. Keep your first camp trip relatively short (maybe 2-4 days). Make a checklist. (Check out this site’s article “Camping Checklist” and create and print-out your own, personalized, checklist). Remember to pack extra clothing and shoes. Kids can get dirty quick, especially while playing in the water, sand, woods, etc. Bring warm clothing, even if you’re camping in summer. Evenings can still get chilly and camping isn’t any fun for kids – or adults – when they’re shivering. Remember the essentials like a first aid kit (for those small accidents), bug repellent, and sunscreen. With children, it’s especially important to keep them busy. 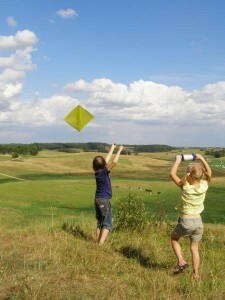 Aside from the camping activities you have planned, take along some toys and games. For first time campers, it is especially important to have items that remind your kids of home. Familiar bedtime objects (stuffed animals, blankets, pillows, books) will make your kids feel more comfortable about sleeping in a different environment. Take along plenty of flashlights (and the more fun alternative, glow sticks) to help everyone see in the dark and eliminate any night-time anxieties. Give each of your children his or her, very own flashlight; personalize them so that there are no ownership squabbles. Don’t forget the extra batteries! If it’s possible, have a battery operated lantern set up in your tent too. Your kids will be working up an appetite with all the activities they’ll be doing on your camp trip, so remember to pack lots of snacks, as well as drinks to keep them hydrated. Hopefully these tips on preparing to go camping with kids have helped you and your family get ready for a fun and safe camping trip. Now that you’re prepared, you can get out, back to nature, and have a camp experience you and your family will want to repeat for years to come. 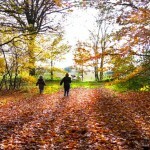 For further tips on family camping, read the continuing article, “Camping with Family”. One response to "Preparing to go Camping with Kids"
Great tips. 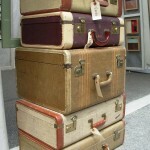 Also remember to pack light as you will be likely carrying much of the kids gear too (depending on age).